In mid-June I was selected to be a part of the Schoolhouse Review Crew's group to review Zane Education's online educational video program. I had never heard of Zane Education, but once I visited their site it was easy to get excited about what their goals and methods are and all that they have to offer. Their online educational video program utilizes what they call "The Missing Piece", which is subtitles. Studies have shown that subtitled videos significantly improve comprehension, as well as reading and literacy skills. The scope of this video program is amazing! Before I cover that, though, let me back up. Upon arriving at Zane Education you are presented with some information about the product. This online educational video program is one of a kind, with a program to meet state educational standards for K-12, to supplement classroom education or a homeschool program, in a way that permits each student to learn at their own speed. In addition to covering all grades, Zane Education tries to cover all required subjects. Subject offerings include: Art, Science, Geography, Health, History, Mathematics, Music, Literature, Religious Studies, and Social Sciences. Have you ever heard of Math Essentials? I had not heard of them last month when I learned that the Schoolhouse Review Crew would have the opportunity to review some of their math programs, so I headed over to their website to learn about them. Math Essentials was created by Richard W. Fisher, a 5th/6th Grade Math instructor in a California public school district. Mr. Fisher ("Rick") has created a system to teach Math that only takes 20 minutes a day, and his system has had great results. Fisher's materials can be used with elementary, middle, and even high school students to very quickly improve their math skills and bring them to Algebra readiness. His materials are also helpful for students for whom English is not their first language. In addition, the author is accessible! He posts his phone number right there on his website, and while I myself did not call him, a fellow Crew-mate said he returned a weekend phone call within an hour! Geometry (book, no DVD, $11.95). The Pre-Algebra Concepts book is a soft-cover book with 96 pages, which can be completed in about one semester. Since Rick Fisher is encouraging the students to write each day's materials out on clean paper, this is an ideal time to wean them from writing in their workbook, which would make it reusable for siblings or for resale. Every one to three weeks there is a page that is the equivalent of a test or a quiz. There is not a DVD lesson for EVERY page in the book, but it is easy to tell whether or not the next DVD session is for the next page, or whether the page is related only to the previous DVD session. If the student doesn't remember the material, he/she can watch the DVD session again. I like that the DVDs are done by a man. Sad but true, those of us moms who are homeschooling boys often have boys that want some of their instruction to be done by a man. I always like it when I can give him a program that is taught by a man. I like the way Rick Fisher lays out the instructions for my son, right at the beginning, telling my son that he needs to start each class with two sharp pencils, his book, and two blank sheets of paper, and that he needs to write on his paper what Rick writes on the board. I like the balance this program his of a little review, a little new material, and a little practical application. Just so you know, I found this ran much smoother (with my particular student), if I watched the DVD myself in advance before my son's "class". It gave me a "heads up", an opportunity to understand the material before it was presented to my son. This way, if he asked any questions, I already knew the answer, or knew I could say, "Just wait and see if he tells you in the video." If Math Essentials materials are really all I need to cover Pre-Algebra, Algebra and Geometry, then I wasted some money on something I already in April for this fall (::sigh::), but I won't make the same mistake next year... I am currently still skeptical and not certain this book really covers everything my son needs to be prepared for Algebra I next year. If I find I am satisfied with this program, then I consider this to be an amazingly affordable program for upper-school math, and I will plan to purchase No-Nonsense Algebra for his next year's program! 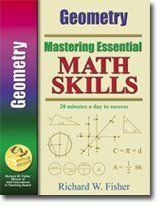 I received a copy of Mastering Essential Math Skills Pre-Algebra Concepts (book with DVD) and a Geometry (book) in exchange for my review of the Pre-Algebra Concepts book and DVD. I did not receive any other compensation. The contents of this review are my personal opinion; I was not told what to say. To see more TOS Schoolhouse Reviews, click on the link below. I have known about the Knowledge Quest (and Bramley Books) company for at least a decade. I used to use Tapestry of Grace as my curriculum, and KQ worked in conjunction with the creators of TOG to create maps that corresponded with assignments. Before that it was very difficult to find the correct blank outline map for the student to use to map Europe before the Congress of Vienna, or to map Ancient China, or the Fertile Crescent. Knowledge Quest Maps also provided the answer keys, so Mom didn't have to scurry to correct maps after the student slaved to find the items requested by the assignment. But even with the Knowledge Quest maps available at that time, I still had difficulty understanding the way the history and geography wove together. I would read the history of the era, and my head was fuzzy about just where the Fertile Crescent was, or I would look at the map of Britain but not really understand where the Visigoths came from, or where the Celts started, and where they went when the Angles moved in. My brain couldn't mesh the maps with the history readings. And somehow Terri Johnson at Knowledge Quest figured out that moms and kids were still having these difficulties with the maps, and she continued to brainstorm and work to come up with a solution. This year I learned that Knowledge Quest had now released TimeMaps! She read my mind! I couldn't wait to see these! I learned that the Schoolhouse Review Crew would be reviewing KQ TimeMaps, and I was selected to do the review! Oh joy! We immediately opened up the maps and began scrolling through them. Each map starts with a screen where you can choose "Start", "Worksheets", or "TimeMap of World History". We ended up settling in on The Black Death, so we clicked on "Start". Each picture on the map, when you point and click, reveals more information about some aspect of the history. (The "Roman Galleon" information is what comes up when you click on the picture of the ship.) Each place on the map where there is a little "i", when you click on it you also receive more information about the history and geography. After perusing my way through most of the maps, I was beginning to think surely I was missing something. What I was getting out of these maps just seemed incomplete -- I am familiar with this company's products. I thought there must be more and I was missing it. As I lay in bed one night (when my mind wouldn't go to sleep) I was pondering this all, and determined to look at it the next day with new vigor, to dissect it and figure out if there was more. That next day was the day I realized that my downloads also came with PDF files that I had been missing. If you open files a certain way, other file types are not visible, and I had just been missing these. The PDF files are Teacher Notes for each of the study areas. Now we're talking! I knew I was missing something. So, yes, the Teacher Notes were a very important chunk of the big picture. They vary in length from one map to the next. They include an introduction, activity suggestions, commentaries on the maps, a fabulous blank timeline template for each map, and more maps for both the student and the teacher. I would add here, also, that the product provides "Quizzes" and "Worksheets" that are questions available on screen. The teacher can require the student to write down the questions and answers, or the two can go over the material together orally. These maps really fill a need for understanding geo/political changes through the history of the world. These changes and progressions can be difficult to understand when piecing together written text with historical maps. Looking at other historical maps, it can be difficult to even figure out if the map you are looking at is from the time period you are studying. 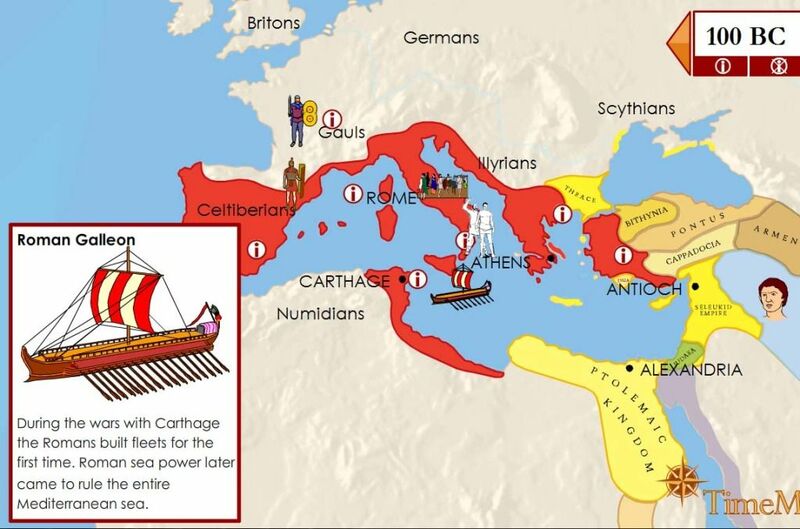 These maps are clearly marked, so you can know where Gaul was in 500 BC, when they attacked and what route they took, etc., etc. Using these maps it is possible to see while you are studying, "This route was taken around these mountains;" "This attack took place over water;" "This route was taken because of this particular geographic feature of the terrain," ...that sort of thing. I really like all the added information using the click on the graphics and the click on the "i" for more information. I like that the Teacher Notes give links to further on-line maps for further learning and understanding. I like the exercises laid out there, and I especially like the suggest class questions to ask the students each time to get them thinking. I really like the topics that are available so far. I am hoping TimeMaps will be created for general European history, showing the progression of the historic battles over Great Britain, who initially lived there, who attacked whom, who moved in, who moved out, etc. as it progressed from Celts, to Romans, to Celts, to Angles, etc. I am hoping TimeMaps will be developed for the Expansion of the British Empire, to show their expansionism efforts during the period when "The sun never sets on the British Empire". I am hoping TimeMaps become available for the French Revolution, the Congress of Vienna, the American Revolution, the War of 1812, the timeline of battles between the French and the British, the American Civil War, World War I, World War II, the Hundred Years War, The War of the Roses, etc. This has so much potential! I am still scratching my head over the fact that there is no audio. I think this would be enhanced for the audio-learner types (like me) if whatever visual window was clicked open had the option, with a little speaker button, to have the audio read for the student. I think this product would be better if the "Worksheets" opened up as printable PDF files. 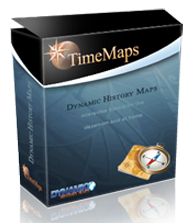 I received a complete digital download of TimeMaps in exchange for my honest review. I received no other compensation. 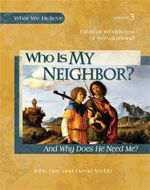 These past many weeks my son and I have been blessed to be able to try out Apologia's Who Is My Neighbor, And Why Does He Need Me, which is the third book set of Apologia's "What We Believe" Series. The first two books in the series are Who is God, And Can I Really Know Him, and Who Am I, And What Am I Doing Here. Apologia created these materials in conjunction with Summit Ministries. 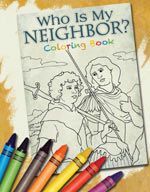 Who Is My Neighbor Coloring Book [price: $8.00; soft cover, 64 pages]. When the box arrived, we opened it immediately to look at the beautiful books inside! I have another of these sets, and I had been looking forward to getting the next installment! The books are laid out in a very flexible format. The Notebooking Journal has a suggested schedule (labeled "Table of Contents" HERE) laid out to give you an idea of how to walk through the program. There are 8 Lessons; but the Lesson Plans lay out 48 suggested assignments. I think they are designed to be done two per week, making the book cover a 24-week period (working two days per week, stretching the book out so that each of the 8 Lessons is completed over a 3-week period). But the intent is that you figure out what schedule is going to work for you and your family. I was so relieved to see that it was okay to spread a lesson out over three weeks, because each "Lesson" (think "chapter) is huge IMHO. During our time to do this review, our normal life got derailed quite a bit. We had an unexpected family hospitalization that caused some lost time (that situation is serious and ongoing, but private, so I won't go into it). We also took a week off for a vacation we had already scheduled. The flexibility this program offers allowed us to work the program around the ups and downs, ins and outs of our hectic weeks of summer. As we began Lesson 1 (which you can see online HERE), I introduced the Notebooking Journal to my son and explained to him that it would be his own personal journal, written by him, for him to use as we work through the curriculum this year. He gets to increase his vocabulary, writing down definitions for new words. He gets to draw his own pictures, do word searches, crossword puzzles, and all sorts of things. That first week we worked through Lesson 1, and he had fun with a word search. And as my step-sister sat in the hospital, he wrote out a prayer for her. Lesson 2 of the Notebooking Journal (that we are currently in) is actually available online for you to see HERE. I barely mentioned the Coloring Book to my son, because his entire life my he has never, ever wanted to color in a coloring book. And this time, he said, "I like to color!" and opened to book and started coloring! ("Who are you? And what have you done with my son?") You can see some sample pages of the coloring book HERE. What I am loving about Who Is My Neighbor is that it is like a finely woven tapestry, with story building upon story, idea upon idea, issue upon issue. The immigration story of Chang Wei and his family winds one theme through the tapestry, as we follow their escape from China, their arrival in San Diego, and their gradual assimilation into a new life in their new country. This theme weaves in and out, while various Bible stories and fictionalized Bible stories, and themes of real life situations and settings, are also woven in, asking the student to think about and answer tough questions. I like that these materials are aimed toward the individual student and do not come across as designed for a class room. I like that these materials are designed for 6-14 year olds. I have long thought there was a need for more materials for the early teen-aged group, materials that a self-motivated student can take and run with, that is interesting and engaging. This series meets that need. I like that these materials can be used by the student, or with the student, or can be used with the entire family. I like that Who Is My Neighbor can be used as book 3 of Apologia's "What We Believe" Series, or it can stand alone. I like the interesting stories contained in Who Is My Neighbor. I like the accuracy of the information presented. I like that any time I doubt the correctness of an item, when I research it to check, I find Who Is My Neighbor is correct! I like the goals of the creators of these materials (which can be found on the FAQ pages listed below). I like that Who Is My Neighbor can be done with no teacher prep time, or can be pre-read by teachers who wish to. I like that I do not need a Teacher's Manual for these materials. The Who Is My Neighbor textbook is reusable; the Notebooking Journal and Coloring Book are consumables. I will be recommending Who Is My Neighbor to my friends! For answers to more questions, go to the Frequently Asked Questions page. 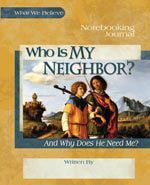 In addition to their Who Is My Neighbor series, Apologia carries a large line of homeschooling curricula and homeschool helps. They have a full K-12 Science line, Geography/History materials, Writing materials, and have an "Academy" you can join for support. They also have books to refresh mom/teacher, as well as hold Apologia Live conferences to refresh mom. They are a great company! DISCLAIMER: I received a set of Who Is My Neighbor materials to review at no cost. I did not receive any financial compensation. I really DO love these materials! If I didn't, I would have said so. My son doesn't care for these materials... exactly... but he is hard to please and he doesn't like new things. They have to grow on him. Everything in my review is my own opinion. If you would like to comment below, I would welcome it! The main blog link to the Schoolhouse Crew Review HERE. The Introductory Schoolhouse Crew Review entry HERE. When I was teaching my kids phonics, I had a bit of a difficult time explaining the “wh” sound. I mean, I “get” that it has an “h” sound in it, and a “w” sound, but it always sounded more “hw” than “wh” when I pronounced it and explained it. My daughter actually said to me that it ought to be spelled “hw”, but I didn’t know what to tell her. This week I learned that in Old English, it WAS spelled “hw”. Sometime, when English was transitioning, “hw” was changed to “wh”, but the sound remained the same. I've been doing so many reviews, and life has been so busy, that I haven't been posting anything that isn't a review! I thought it might be fun to have a theme, for awhile, of "Learn Something New Every Day!" As long as I can I will try to post a new nugget each day. Life is real, so I doubt I'll be able to post every day, but I'll do my best. So, here is my first nugget. In World War II, a new land vehicle was developed that could be transported by glider, that could go fast, was 4-wheel drive and could go over rugged terrain. It had a low profile to make it a difficult target. It included a shovel, an axe, an extra can of gas, a handy place for the driver to store his rifle. It was called a “GP”. Over time it came to be known as a “Jeep”. Our homeschool is very literature based. 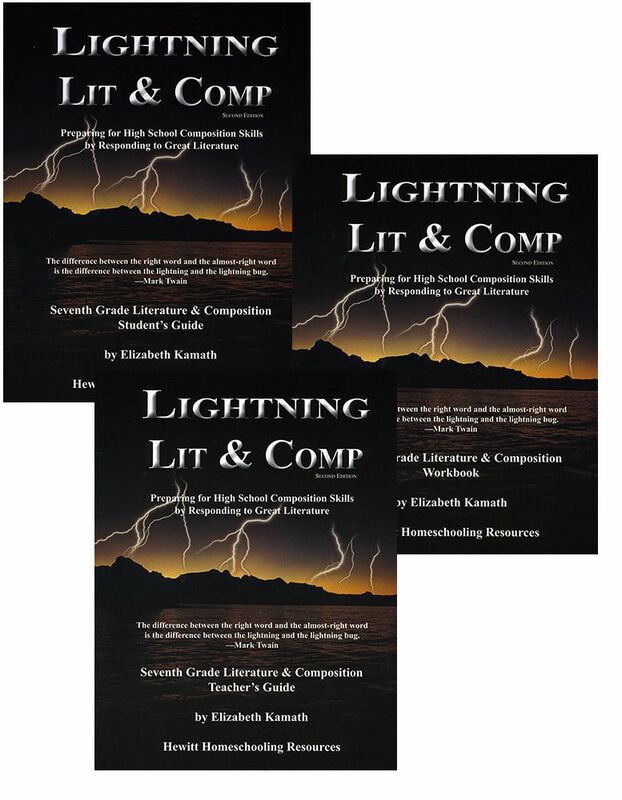 When I learned that Hewitt Homeschooling Lightning Lit & Comp ("Literature and Composition") was going to be reviewed by the Schoolhouse Review Crew, I immediately went to their website to see what they are about. My son is now in 7th grade, so I looked immediately to the 7th grade level. I was very pleased to see that Lightning Lit is a literature-based program, and I volunteered for the review. I was very pleased to do so, because many of the titles in this set line right up with the plans I have this year for JD and his literature. We have been strong in our literature coverage in the past, but weak in our composition and mechanics, so I was very interested to see what this program had to offer. I have been aware of Hewitt Homeschooling, for twenty years, although I have never used any of their products (other than a "Scope and Sequence" decades ago). Hewitt Homeschooling originated with co-founders Carl Hewitt and a pioneer of the homeschooling, Dr. Raymond Moore, who wrote many homeschooling books that I own, with his wife Dorothy Moore. Seventh Grade Literature & Composition Teacher's Guide (105 pages) (Priced at $20.00). You can go here to see the Table of Contents, information on How to Use and Schedule, as well as a sample chapter! Seventh Grade Literature & Composition Workbook (162 pages) (Priced at $20.00). Many of the titles in this Literature Plan were already in my plans for 7th Grade! This was an amazing fit to me for my upcoming school year. And, as I looked at the schedule for how to do the program, I was pleased that the methodology largely lines right up with the pace that I like to cover our literature books. Well, he just loved Week 1 of Rikki Tikki Tavi! I actually slid into doing some of the work as we drove home from vacation. We had done the reading, and my son really seemed pleased with himself at being able to answer as I asked him the questions from the book, and my husband was impressed with his recollection of a reading that had occurred some time ago (as in we did not cover the questions even the same week as the reading, but rather after a lazy week of vacation, with lots of distractions that could have kept my son from remembering the story). JD actually remembered the facts of the story better than I did, and I had read it out loud to him! During our reviewing period, we moved on into Tom Sawyer. I am just loving knowing that I am now equipping him with information he needs for his foundation as he approaches high school - the mechanics of the literature, not just the literature itself. This program goes, step by step, very methodically yet incrementally, through Plot lines, openings as a device in writing, nouns, adjectives, capitalization, use of apostrophes, graphic organizers, pronouns, antecedents, knowing and writing to your audience... There is in-depth material on poetry: rhymes, couples, limericks, and haiku. After five weeks with the material, I still find that the biggest difficulty we have in our home school is that my son does not want to be told what to write, and he does not want to write what he is told. He also does not want to review what he has written and does not want to revise what he has written -- he just wants to be done with it. This is a bull I am going to have to take by the horns this year, wrestle with, and win over, because writing skill is going to be essential to his college success. I believe that this curriculum will, this year, help me do just that. The fact that it combines the composition course with the literature materials seems just the right recipe for our family for this up-coming school year. I couldn't be happier! Hewitt Homeschooling's Lightning Lit & Comp for Seventh Grade is a rich resource, and I am giving it a very high score for my home school. It is my opinion that this material is easily adapted to be used for 6th graders and 8th graders, as well as 7th graders, however for my 7th grade son it is a perfect fit. This program has such a variety that I think it will benefit all learning styles. I think this program runs most smoothly when the teacher prepares before the lesson, by pre-reading the guides and knowing what is coming up for each day's assignments. Each student would benefit from having their own workbook, but the other books are reusable and non-consumable. In homes with two students in the same grade, it's up to you whether to share or let each student have their own Guide. I have been very impressed by this program. I will be recommending it to my friends. In addition to Lightning Lit & Comp for Seventh Grade, Hewitt Homeschooling has a complete line of materials for grades K-12. They not only carry literature packages for every grade level -- they also have programs for the various grade levels in Art and Music, Bible and Character, History and Geography, Mathematics, Science and Health, Thinking, and Vocational. If the material I reviewed is an indicator (and I'm sure it is), this is a company that I will be coming back to in the future for other materials for my home school! DISCLAIMER: I received, from Hewitt Homeschooling, a three-book-set of Lightning Lit & Comp for Seventh Grade at no cost. I did not receive any other compensation. I was not told what to say in my review; the opinions contained herein are my own and have not been influenced by outside forces. I love this program! To see additional reviews of this product, and other products by Hewitt Homeschooling, please go to the Schoolhouse Review Crew blog page for Hewitt Homeschooling, HERE! This has been a Schoolhouse Crew Review! I hope you have enjoyed reading my thoughts and experiences. Please feel free to leave comments below! For over a year now my son has been asking me to teach him Spanish. All the while I had been trying to teach him French, which I speak, and Latin, which I was learning with him, but I felt inadequate to teach him Spanish. I kept buying different versions of Spanish courses, and had the opportunity to review a different one months ago, all with good intentions, but with very little in the way of results. Then I learned that we would have the opportunity for him to take seven weekly Spanish lessons via Skype, through Homeschool Spanish Academy out of Guatamala. I have long been a believer that "immersion" language learning is the best method to use to teach a foreign language and to learn a foreign language. I was not having success immersing my son in Spanish largely because I did speak it myself, and it is hard to teach something you do not know. The Homeschool Spanish Academy is a language program taught via Skype meeting. Since it uses this level of technology, the user's computer needs to be checked to make sure it meets the technology's requirements and will be fast enough. I had to have my son use my laptop, because his does not have a camera and does not have a built in microphone. My computer initially did not pass the test, but after a little tweaking and a retest, we were qualified and good to go. By this time I was looking forward to getting started, and was convinced we would have good success. So I clicked on "Sign up now" at the top right of the page (yellow button). The "How it Works" page tells you everything you need to get started. The instructions are there for signing up for a free lesson, testing your computer speed, packages you can choose from (different age levels, length of course, number of classes per week), how to sign up for your first class using Schedulicity, how the lessons work, and how the homework works. That's a lot of information packed into that one page! I signed up for an account and for a trial lesson. Before I knew it I was receiving a telephone from Homeschool Spanish Academy "Tech Support" (who happens, also, to be the owner of the company). He walked me through the speed test and helped me get signed up for our first lesson. (Since I was a reviewer I wasn't really supposed to take a free trial lesson.) We signed up for the Middle School lessons. My son, aged 12, could have gone either Early Language or Middle School. Our first lesson I sat beside my son. He often has focus issues, so I didn't want him to just walk away from his lesson. I found he was not willing to answer the teacher as she asked questions -- he didn't know the answer and was afraid to say so and also afraid to say that he didn't understand or didn't know the answer. At about 30 minutes he kind of melted down and ran away from the computer, so I finished the class to learn what the homework was and what else would have been covered so I could go over it with him during the week. I don't know why he had/has this fear, but it continued to plague us through all of these lessons. After the first lesson, the owner, Ron Fortin, called to chat about how the class went and to answer questions. He asked if I had any suggestions of how we might change things to make the class work better for my son. Since my son had requested a male instructor and there were non, Ron offered to sit in through the class if it would help my son. He was very helpful and involved in trying to make this work for us. During the class there had been some times when JD had not known the answer to the question asked, and I told him, or he hadn't understood the question in Spanish, so I told him in English what he had said. Ron suggested that maybe, for the next class, I should let him be alone with the teacher, so that's how we did the 2nd class. Second class he sat at the dining room table alone while I sat out on the deck just outside the dining room door. He again lasted about 30 minutes and then ran to his room in tears, and I came in and finished the class so I could go over it with him later. Later in our series of classes my son had a sick week. Ron was very understanding, allowed us to cancel and reschedule, and said rescheduling for sickness is not a problem. For other conflicts they ask for 24-48 hours notice for a class to be cancelled and rescheduled. Adult Program (50 minutes once a week). This program has so many different levels and ways to take the course that I think I would bore you to tears if I listed here all the many options. 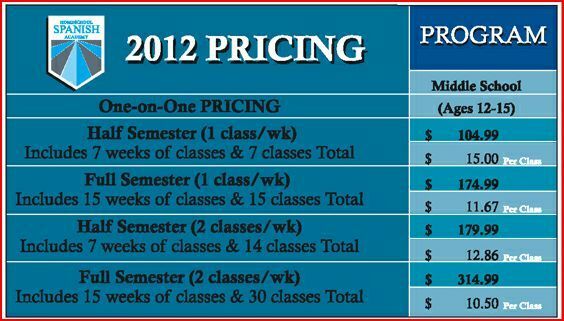 You can see the pricing for the different levels by clicking the above links. For the level we were taking, Middle School, the options are 1) one student one class per week; 2) one student two classes per week; 3) two students one class per week, and 4) two students two classes per week. We were taking one class per week for one student for seven weeks. Each week the lesson is emailed to the student/parent. I liked getting the material printed out for my son to look at during the Skype session. We always tried to open Skype with ample time before the class was to start to make sure we didn't have any unexpected glitches. Then each class we would go over the printed materials for that week's lesson, and also go over the information for the homework the student was to complete for that week. Later, after the student completed the homework, it was to be sent to a certain email address for homework. It was then corrected and returned by someone at Homeschool Spanish Academy. (There was at least one week when they did not correct and return my son's homework, but when I emailed them they took care of it right away.) Early Language students are assigned about 30 minutes homework per week; Middle School, High School and Adult classes are assigned about an hour's homework per week. In my opinion, to really learn Spanish well the student should actually be doing review of the current week's lesson for at least twenty minutes daily. We were not very consistent with this, and I think my son might have been more successful with this program if we had been. We had a recurring difficulty adjusting to the fact that the class times are posted in Mountain Time. It was difficult to get used to signing up for one time and remembering that our class was actually two hours later, being Eastern Time. One class got rescheduled somehow so that I got a reminder that the class would be at 11:30 Monday, and on HSA's end they had me down for a class at 1:30 Tuesday. We never did figure that one out... And there was at least one day when I was calling them when they didn't call me when I expected, and if I remember correctly that was because of the time difference. The quality of the instructors and the lessons was exemplary. I was sorry my son just couldn't work well with it. I did sit with my son through most of the classes, and studied the homework with him, and I myself did learn a lot. I think the biggest difficulty we had was getting our study time and homework done daily between the lessons. I think the program would be better if the company could create videos (or at least audios) to be available to the paid students, that they could play, watch, and practice with between the Skype lessons. That would have helped us a lot. The Spanish taught by Homeschool Spanish Academy is specific to Guatamala. If I understand correctly, the different countries and different areas have inuendos and little differences in the way the language is spoken. Not being knowledgeable about this sort of thing, that's all I can really say about it. The customer service at Homeschool Spanish Academy was the best! I began to thing that Ron Fortran sleeps with his Skype open on his bedside table! Any time I texted him or called him, he replied almost immediately! The Spanish teacher's were excellent, well trained, and for the most part understood our English at all times. I think any misunderstandings we had could have been largely related to Skype, and voice processing only being able to go through one way or the other. In other words, if we started talking while she was talking, I don't think she could hear us until she stopped talking, I'm not sure. One other suggestion I would have: Currently Homeschool Spanish Academy has only female instructors. My son would have preferred a male instructor. Homeschool Spanish Academy did not require any additional materials to be purchased. The lessons were delivered to the student incrementally. Printing the lessons wasn't required, but was helpful. Since they were in color, that can be expensive. Also, my son thought some of the illustrations were corny-looking. I thought they were okay. The purpose of the product Homeschool Spanish Academy provides is to teach students to converse well and with a proper accent. I believe this program is excellent for that, even though it didn't fit for my child. I think their method of teaching the pronunciations of the alphabet on the first lesson is key for this, and then the regular corrections of mispronunciations. That is what makes this program so good -- the real live person teaching the lessons. □ I liked working with Skype. This was new for me, using Skype. □ I liked the challenge. I've come away having learned some Spanish, even if my son didn't. I think he probably did learn some, but I probably learned more (I probably applied myself more than he did). □ I didn't like that there were no male instructors. I hope they can change that in the future. □ I didn't like that there seemed to be some mistakes in the papers -- the lessons and the homework. Specifically, Lesson 1's homework asked that a raspberry's name is in Spanish, but we had never been given that information. There were some places where words (in Spanish) were randomly capitalized, and I thought they were incorrect, but not knowing the language I can't really be certain. □ Overall, I really liked Homeschool Spanish, and my son really didn't. □ I would definitely recommend this program to anyone, especially since they can try it for free! Our family was given a 7-week course of Homeschool Spanish Academy in exchange for our review. We did not receive any other compensation. My opinions and words are my own, and are not influenced by any other factors. This review brought to you by The Schoolhouse Review Crew. Let me know what you think! Leave me a comment!